Nothing beats the flavor of fresh, homemade popcorn. That is, unless you top your kernels with some tasty seasoning. With these blends, you’ll never settle for plain popcorn again. Everyone loves popcorn. It’s cheap, it’s easy to make, and it’s delicious. It’s the go-to savory snack at movie theaters, parties, and office break rooms. And nothing beats the flavor of hot, freshly made popcorn at home. Well, almost nothing. Once you top your kernels with these quirky spice blends, you’ll never settle for plain popcorn ever again. Swedish-born culinary expert Linnea Johansson has been hired to plan parties for celebrities such as Justin Timberlake, Sarah Jessica Parker, and Julianne Moore—and with recipes like her Parmesan-Truffle Popcorn, it’s not difficult to see why. This savory seasoning blends earthy, buttery, and cheesy flavors for the perfect party treat. Melt the butter in a saucepan over low heat or in the microwave. Remove from heat and stir in truffle oil. Drizzle mixture over popcorn, then add the Parmesan cheese and toss to coat. 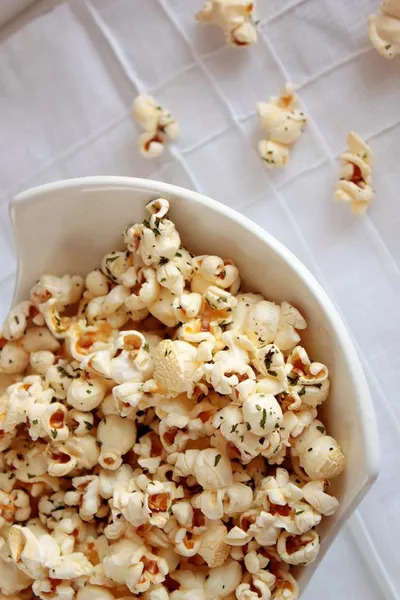 “Try other flavor mixes, such as smoked paprika powder instead of truffle oil, to create a smoky and spicy popcorn snack for your guests,” suggests Johansson. 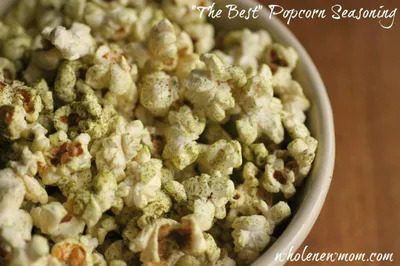 Adrienne Urban at WholeNewMom.com loves to experiment with popcorn toppings, and her Surprisingly Good Popcorn Seasoning is very aptly named. Eschewing butters and oils in favor of well-balanced spices, Adrienne delivers guilt-free popcorn without sacrificing an ounce of flavor. “Wherever we take this popcorn (and we take it EVERYWHERE), people ask us for the recipe,” she writes. Thoroughly mix all ingredients in a small bowl. Transfer to a glass or plastic container with a tight fitting lid. Stir or shake well before sprinkling atop freshly popped popcorn. “You won't be disappointed,” says Kristen Rosenau of her Italian Breadstick Popcorn seasoning. As a serious foodie and pastry chef, Rosenau owns and operates PastryAffair.com, where she shares her passion for all things edible. And although she mostly sticks to sweets, Rosenau makes an exception for her Italian Breadstick seasoning, which manages to pack the herby, garlicky kick of restaurant breadsticks without the excess calories or butter. Mix together the basil, parsley, garlic salt and popcorn salt in a small bowl. Transfer your freshly popped popcorn to a larger container with a lid, then add the spice mixture and drizzle the olive oil on top. Close the lid and shake until the popcorn is evenly coated with spices. “Doing this while the popcorn is hot will allow the spices to stick better to the popcorn, resulting in a better flavor,” suggests the chef.